How do you convince students to believe in themselves? To reach for something more? That’s what a program called AVID aims to do. Last fall, the district introduced AVID (Advancement Via Individual Determination) into all three Central Kitsap high schools. More than 80 students, mostly freshmen, are participating this year. About 5,600 schools globally have adopted AVID. It’s been attractive to schools that want to level the playing field for students, regardless of their social, economic or racial backgrounds. The program centers around an elective class. Teachers nominate students who meet AVID criteria. Students sign contracts pledging to take at least one high-level course, such as an Advanced Placement class, to finish all their homework and more. Through AVID strategies, teachers help students build foundations for succeeding in all classes. Students learn to take effective notes, ask good questions, and work with a group. In being chosen for the program, the message to students is: We believe in you. Now you have to believe in yourself and work hard to live up to those beliefs. Twice a week, AVID students break into small tutorial groups during class. They write out questions on white boards and ask their peers to help solve them. Trained tutors also offer guidance. 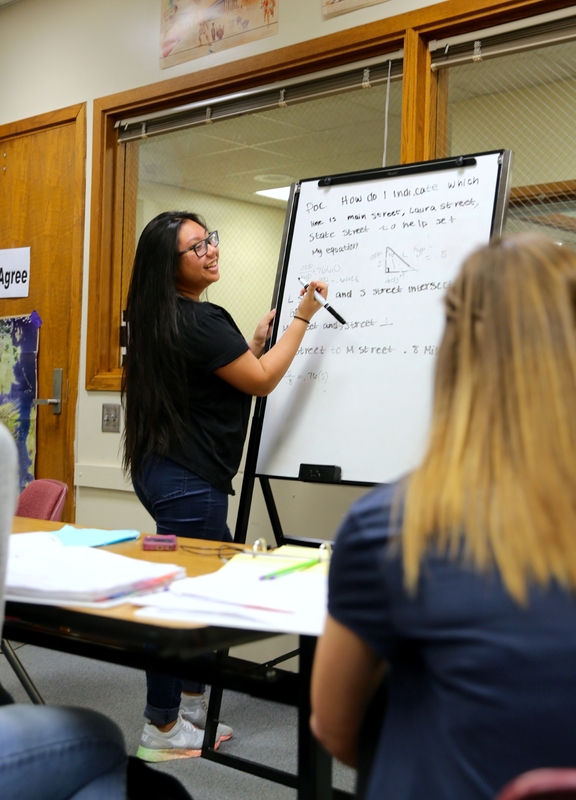 On a recent Wednesday, Olympic High sophomore Amaya wrote out a math equation. Her classmates pepper her with questions, without just giving her the answer. The intent is to force her to look again, dig deeper and see that it was a simple mistake. “Did you see what you did?” one classmate asks. “Yeah, thanks guys,” Amaya replies. Throughout the class, their teacher checks their work. On other days, their teacher will review their notes from other classes, check their binders or check their grades. “There’s been amazing growth,” said Klahowya Secondary AVID teacher Jeff Witte. Previously timid students are presenting to crowds or jumping in to group discussions. More than 90 percent of AVID seniors nationwide complete 4-year college entrance requirements. That’s about double the national average, according to AVID. The district plans to expand the program by adding a class each year for incoming freshmen. But AVID’s impact is expected to go beyond its elective classes. Each schools’ AVID leaders share strategies with other teachers.